The Post Headquarters was constructed in 1905. The Post Commander's office was located here, along with other administrative offices, post office, and the Fort's telephone exchange. An ornate auditorium on the second floor was often used for parties such as the masquerade ball held on January 2nd, 1906. During World War II this room was partitioned into additional administrative offices. The Nebraska State Historical Society opened the Fort Robinson Museum in June, 1956, as part of the effort to preserve Fort Robinson's heritage. 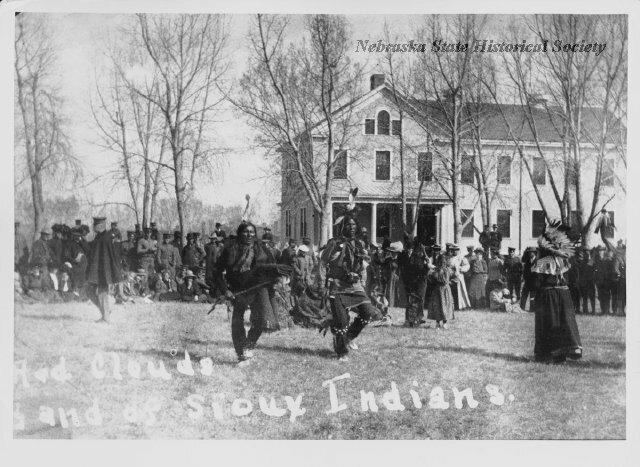 “Post Headquarters, 1905,” Explore Nebraska History, accessed April 19, 2019, https://mynehistory.com/items/show/127.